I wasn’t going to blog about this project yet, since I have several posts already written and pretty much ready to go, but I couldn’t stand it any longer. This is what I did ALL of last week. I will show pictures later of how I made the pillows and the cover for the daybed but here are the before and after pictures. And this is just phase 1 of a complete redo of my back porch. Phase 2 will be using Annie Sloan’s chalk paint (click here) on all of the rockers and more, much more. 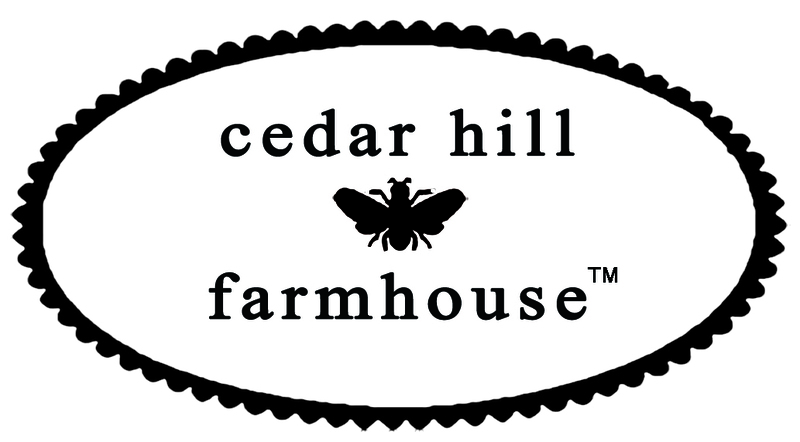 To see this paint “in action” so to speak, check out Miss Mustard Seed’s post about it here. First is the BEFORE picture. 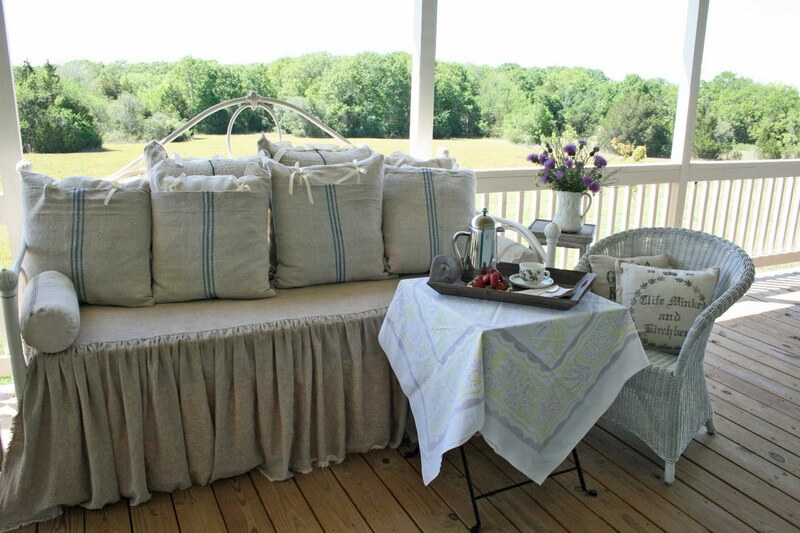 I made the cover and most of these pillows for the back porch daybed about two years ago, using outdoor fabric. 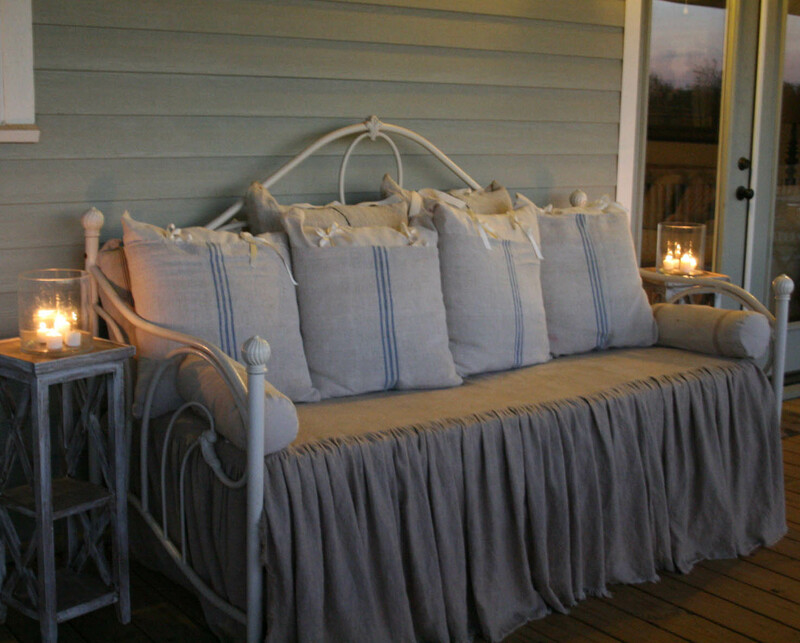 The fabric wasn’t really my style, but I wanted an outdoor fabric, because the daybed is OUTDOORS. There weren’t many choices in outdoor fabrics, so this was the one I thought was the best choice. Then Mr. Mouse had his way with it. You can see him in the previous post, Everyone’s a Critic. Yes I know he is cute, but if you could see what he did with my daybed cover, you might think differently. I am appalled Mr. Mouse. Have you no shame? Did your mother teach you to chew on other people’s things and then treat them like a latrine? Oh, I guess she did. Well Mr. Mouse, you actually did me a favor. Your selfish actions forced me to recover the daybed. That’s right, I was looking for an excuse and you gave me one. BTW, the new bedding will be kept inside when not in use, so you lost your little snuggly place to sleep and … never mind. So here is my big reveal. And after sewing 10 pillows and a daybed cover you bet I will be showing more than just a few photos. I had two authentic, vintage feed sacks sitting around my house that I had purchased at The Round Top Antique Show, Reflections on Round Top. I purchased one more, some ribbon, and linen fabric for the daybed. Feed sack pillows typically run around $70-$100 a piece and these cost me about $20 each plus my labor. Check back later and I will show how I made them. The daybed cover was also a huge savings since comparable covers cost around $300, and my fabric was less than $100. It was a beautiful day, and I spent almost the entire day on the porch enjoying the breezes. I did a very simple enclosure on my pillows, using ribbon similar to what I saw on Miss Mustard Seed’s header, click here. Notice that I took the time to fringe the bed skirt. This was a rustic finish that I thought was very fitting. My Collie got bored waiting for me to run with her, so she decided to take a nap. Good choice! After all that work, I decided to relax and enjoy the new daybed. I curled up with my iced tea and some interior design books. It was SOOOO NICE. Mr. CH and teenage daughter were gone for the afternoon. That left things nice and quiet on the back porch. After an al fresco dinner on the front porch, we took an evening stroll down to the creek, then back to the porch to sip mochas and watch the stars come out. I found your blog at Adventures at Greenacre. I am your new follower because I really like your content. It looks wonderful and, you’re right, the pillows look like the ones form my header. I love those pillows! Anyway, thanks for sharing! Thanks so much for stopping by oneshabbychick! I love love love your daybed makeover! You did a fantastic job. I love the slipcover and how the ruffle starts before the edge, and the fringe. Nice touch. And the grain sack pillows are beautiful. Love it… very cute and country! I like the look paired up with the white wicker. I found your blog because you are the newest follower on my blog and I hopped over to see what yours was about. I liked it so much I’m following you now! Love the daybed cover. I have an old (1930’s or 40’s) fold out couch that I need to make a slip cover for. Now I feel inspired to start thinking about doing it! Thanks Tina. I love slipcovering too!! Look forward to seeing your future projects on GirlsLikeShabbyChic!! Love all that glorious linen and grain sacks. What a great look and so comfy. Thanks Kim, I am loving your style on Savvy Southern Style. 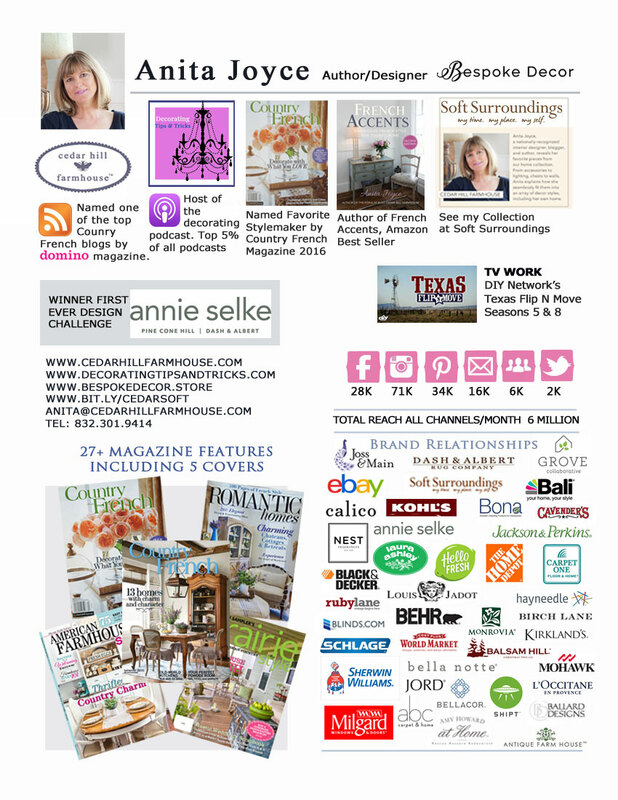 Thanks Mary for the feature on Boogieboard Cottage!! 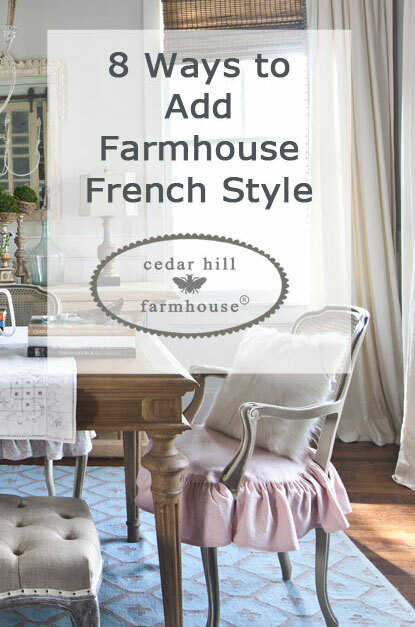 Courtney, I LOVE, LOVE your blog French Country Cottage. I would love to share. Oh my gosh, do you rent that out for vacationers?! It is beautiful! Plus, I’m very super jelous of your porch. Gorgeous! 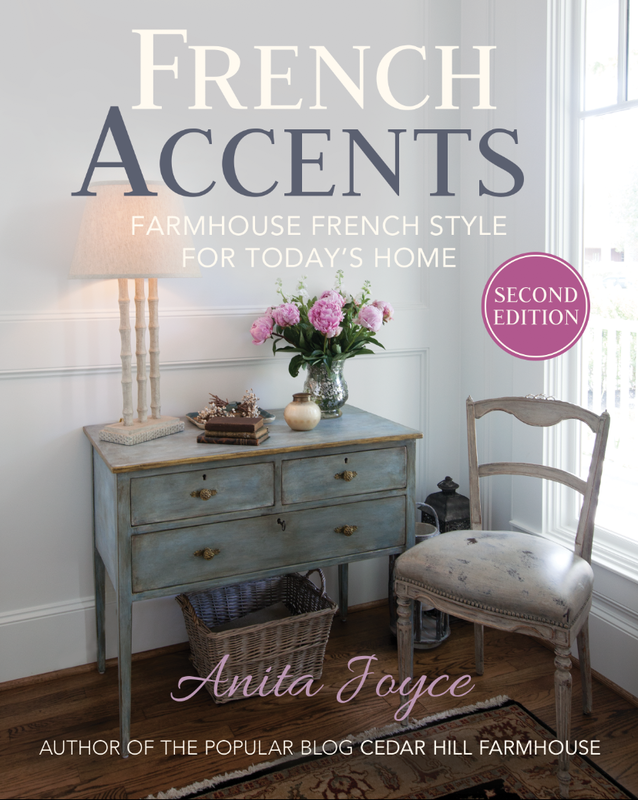 Just like French Country Cottage, sorry if this is a double comment 🙂 But, I just need to know-do you rent this out to vacationers needing some relaxation?! It’s beautiful! Plus, I’m very super jelous of your porch. Gorgeous! Emily, we haven’t rented out the house, but we do plan to build a guest cottage and will rent that out when we get that built. I’ll let you know!! Hey there Anita~ So loving this post all over again!!! I just stopped back by to say thanks so much for linking up at Feathered Nest Friday! Sharing this on Facebook~have a wonderful weekend! Anita, that is just beautiful! You are so talented. I love it – it is so you! Wow- was searching for the perfect daybed inspiration! What a lovely “little” project you did! I love how this transformed your daybed. Just beautiful. But how will you keep Mr. Mouse away? Nita, yes Mr. Mouse is a problem. I am not leaving the bedding outside at night or while we are away. Because even if you get rid of Mr. Mouse, there is always a Mrs. Mouse, and lots of babies. Love your daybed!!!! It turned out fantastic! I love your sweet porch redo, Anita. I’m so glad you linked it to the party. Come by tonight to see it featured. 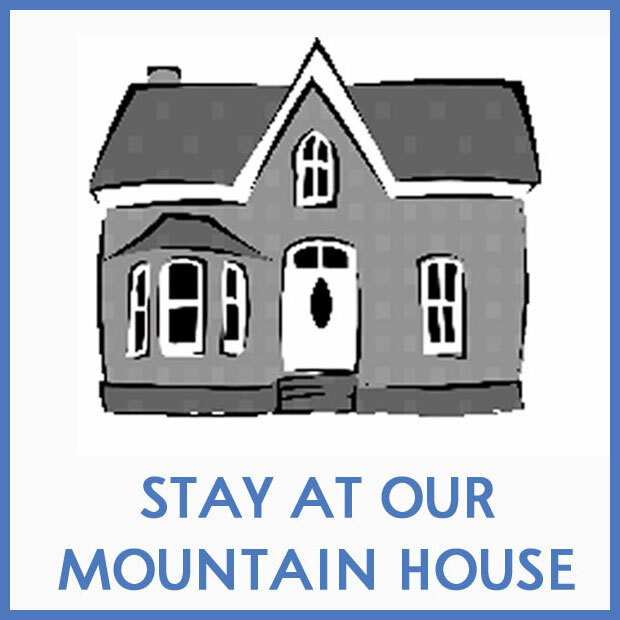 I’m visiting from Courtney’s @ French Country Cottage. Fabulous day bed!! It is so dreamy, love that skirt and those pillows. Hi Anita! I’m here from My Uncommon Slice of Suburbia – and I’m loving my visit! You totally had me at ‘grain sack’. I am obsessed with them. I can never have too many of them. And what you did with yours is just fabulous! No wonder you spent all afternoon snuggled upon it. Just beautiful! 🙂 And your ranch….? INCREDIBLE! I looove this redo! Thank you so much for visiting my link party to share your creation! Amazing!!! What a beautiful transformation! Thanks for linking up with Patches of Pink! 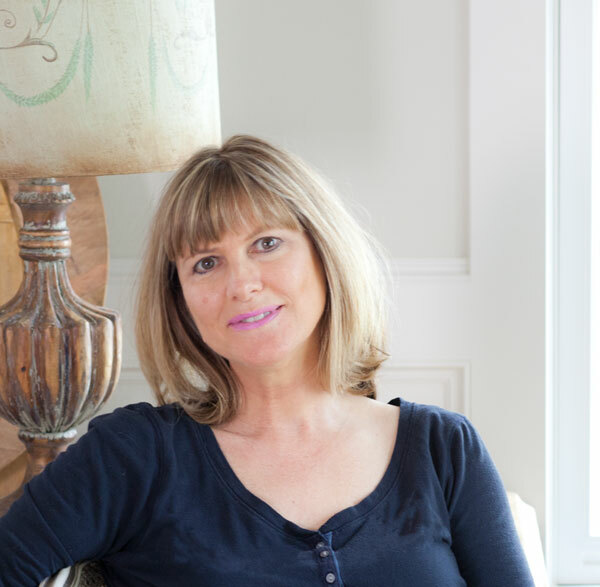 Glad to have found your beautiful blog! Following from the Weekend Blog Hop – hope you’ll visit me at http://EverythingBeautifulInItsTime.com! found you thru finding friends hop. I love the daybed and those feed bag pillows, wow! Hello, I’m here from the blog hop and your newest follower. Hope you’ll come visit and follow my blog too. I’d like being one of your official blogging friends. Thanks! Really nice transformation! Thanks for linking up with us on Patches of Pink! WOW Dear! This is GORGEOUS! You are very talented! I’ve enjoyed your submission! 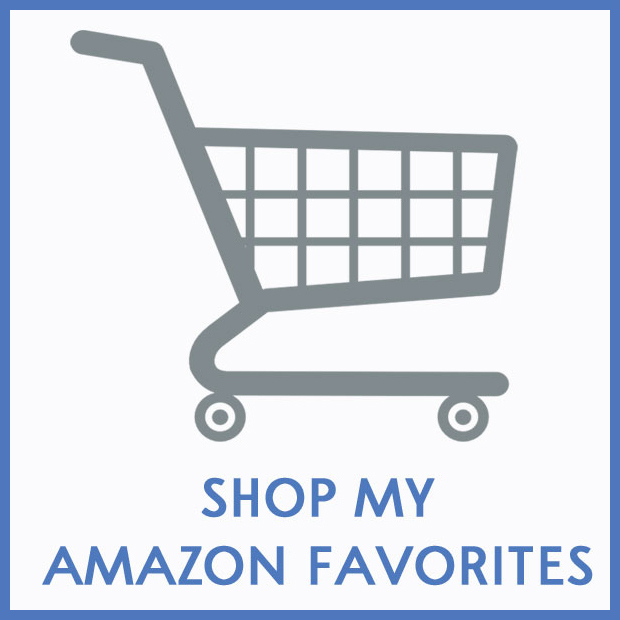 Thank you for linking up with us at Patches of Pink. I’m your newest follower and I hope you’ll be mine too! Anita, your new daybed, look incredible. I love the linen fabric, it’s so pretty, and the feedsacks are a wonderful touch. SO MUCH better than what it looked like before, although, without the after shot, it wasn’t so bad, hehe. I love your beautiful dog too, she is GORGEOUS. Thanks so much for finding your way to my blog, and linking up to my party. I REALLY hope you become a regular. Wow that turned out beautifully. I am planning on decorating my daughter’s room and this is what I had in mind. Do you have a turorial for the daybed cover? Love this! It would be full of spiders where I live but I love it! I found your blog on Chocolate and Sunshine and when I searched you out I immediately found a corner of shade on a hot and sunny day and I’m staying for a nice cool drink. 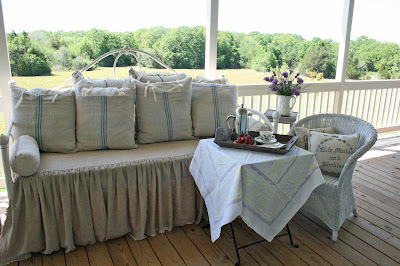 I loved your blog about your daybed cover and pillows. It’s fun to find someone so creative. Looking forward to many more posts. Soooo cute! I love your blogs and Instagram! I can certainly see why this project is a reader favorite. It’s beautiful and timeless. Hi, I am iacopo from japan. It is a crowdfunded wooden daybed made without a single metal part and its dimensional module comes from the Kyoto-size tatami mat.